This book is something special! With its subject matter, it’s definitely not for everybody. Those who are very conservative and/or easily offended might want to stay away. Then again, maybe this is exactly what the doctor ordered. It’s a piece of writing that has been popularized by a movie starring Johnny Dep and Benicio Del Toro. 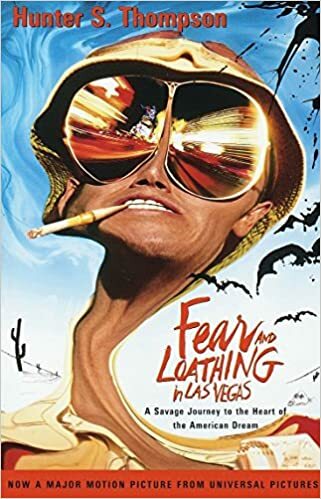 It’s the pioneering work of the genre Gonzo Journalism, “a style of journalism that is written without claims of objectivity, often including the reporter as part of the story via a first-person narrative.” (Wikipedia). The book is entertaining on so many levels. I can’t stop laughing at the made up credential: “I’m a Doctor of Journalism”. Thompson offers readers a thorough lesson on drugs and drug culture. The story line is so “out there” that one can’t help but wonder what real-life drug use fueled this creative masterpiece. But you don’t have to wonder all that much, because it is allegedly mostly based on real life events.